It has been cloudy today with rain off and on. It is humid temps in the low 80″s, the winds were west at 4 to 9 mph. Avon had reports of Bluefish, Sea Mullet, and pompano. Buxton had some Spanish Mackerel and Sea Mullet. Here in Frisco Sea Mullet were reported. Inshore boats caught Gray Trout, Bluefish, Puppy Drum and Spanish Mackerel. The offshore boats caught Dolphin, Wahoo and Tuna mixed in. A few charters released Blue Marlin. 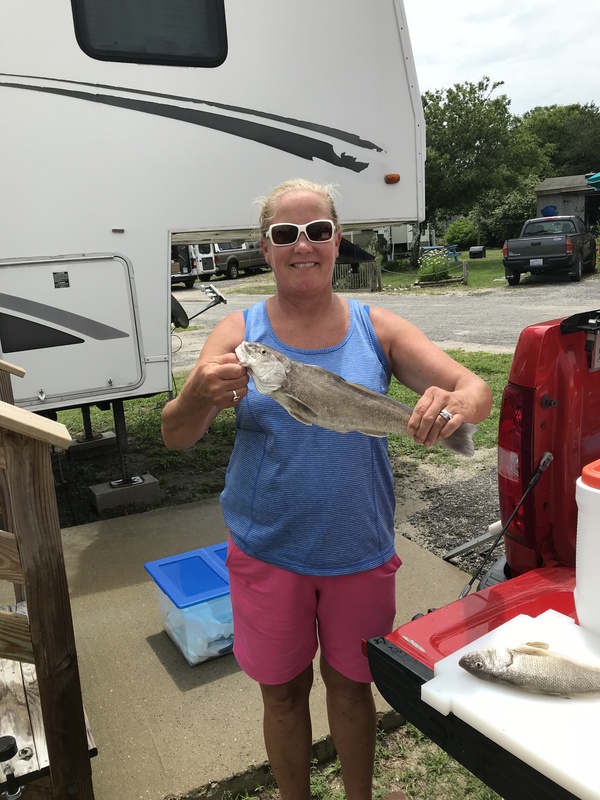 Pictured is Gina Baker from Buxton, NC with a citation Sea Mullet. Today we had a cold front move in with strong winds from the North West. Sustained winds in the mid 20s, and gusts over 40. The day started with temps in the low 30s, reaching 40 in the afternoon. We have no reports of fish caught today. The Bromley Zip Neck feels like a sweatshirt, cut with the familiar loose, easygoing fit and styled with rib-knit cuffs and hems. 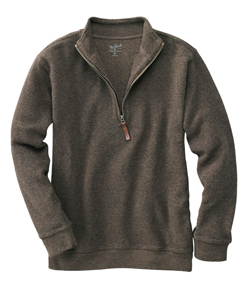 The thermal heathered fabric resembles a knit sweater outside, but is soft and smooth inside. Features stand-up self-fabric collar. 100% cotton. Imported. Machine wash.
Today we had sunny skies. The winds were from the north northwest at 10 mph and the temperatures were in the mid 60’s. In Avon some scattered sea mullet were reported. Around Buxton Puppy Drum, Bluefish, Speckled Trout and Sea Mullet were caught. 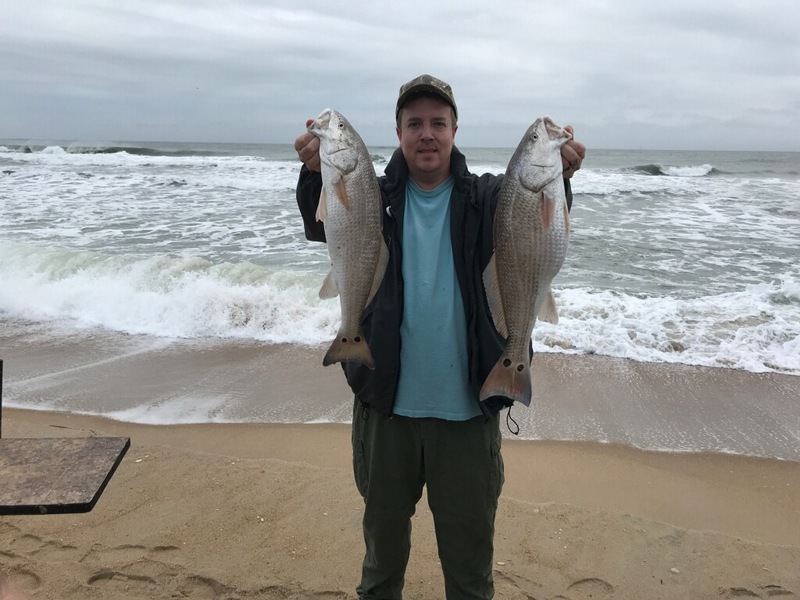 Over on the Frisco beach some Speckled Trout were caught along with a few Bluefish and some scattered Puppy Drum. Off shore charters reported Blackfin Tuna and some Wahoo. 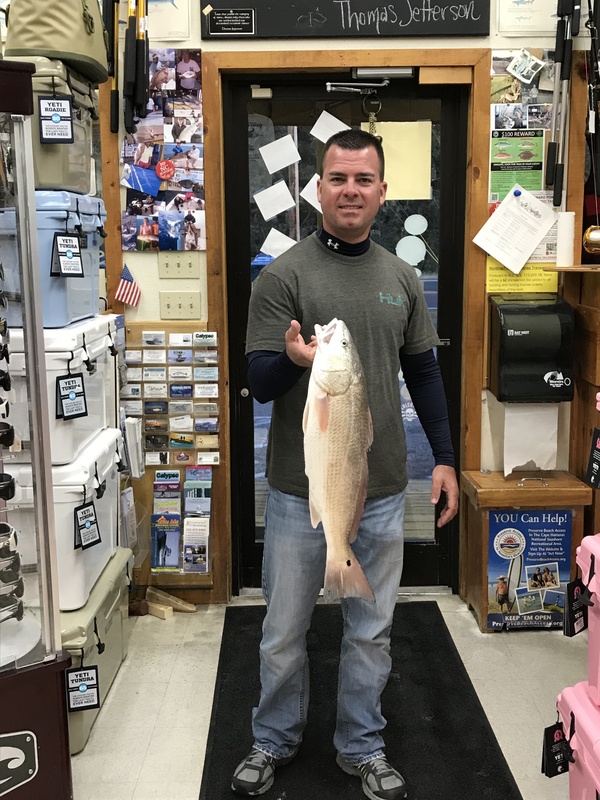 Inshore charters reported Puppy Drum and Speckled Trout. Pictured Stephen Perry from Hickory, NC. Pictured is Jason Baker from New Jersey with a 24 inch Puppy Drum. Today we had calm winds and sunny skies. The winds were from the north at 5 mph. The temperatures were in the low 70’s. Around the Buxton beaches sea mullet and spanish mackerel were reported. Out at Cape Point in Buxton bluefish, spanish mackerel and sea mullet were reported. Over on the Frisco beach sea mullet, bluefish and some puppy drum were caught. The inshore boats had excellent spanish mackerel, good bluefish action and the puppy drum bite was good. There were a few cobia’s caught as well. The offshore boats had excellent gaffer dolphin action, a good tuna bite of blackfin, yellowfin and big eye. 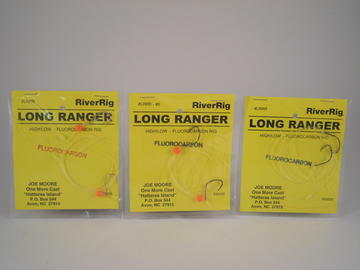 Good triggerfishing was reported off the bottom. Today was another beautiful day with light winds. The winds were from the north-west at 5-10 mph and the temperatures were in the low 70’s. Avon Pier had some nice spanish mackerel catches today. Out at Cape Point in Buxton several spanish mackerel and bluefish were reported. The Frisco beaches had sea mullet and blow toads today. The inshore boats caught cobia, big bluefish, puppy drum and some speckled trout today in and around Hatteras Inlet. The offshore boats caught dolphin, a few yellowfin tuna, wahoo and blackfin tuna today. 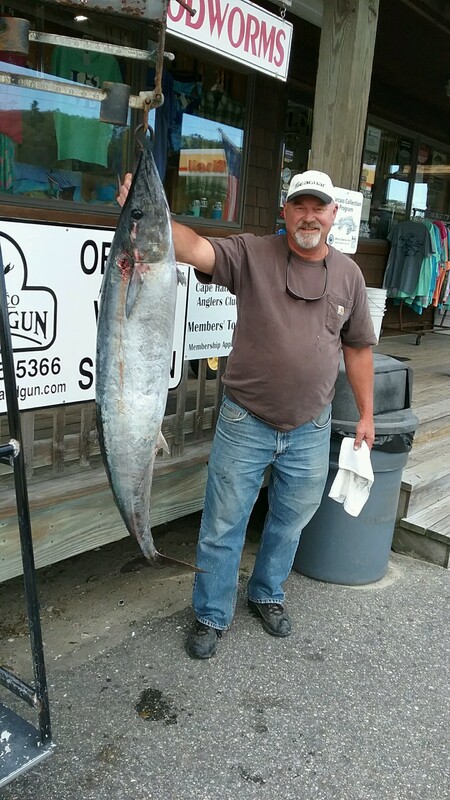 Pictured is Jeffrey Wolgemuth of Townsville NC with a 47lb wahoo caught out of Hatteras today. Pretty work Jeffrey!! !